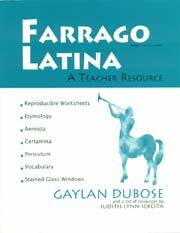 A valuable tool for the Latin classroom, Farrago Latina is a collection of resources, activities and reproducible worksheets culled from the vast experience and amply stocked files of Gaylan Dubose. The author provides both new and veteran teachers with a variety of opportunities to make instruction and practice in Latin lively and memorable. Iincludes tips on etymology, themes and figures of speech in the Aeneid, commonly confused words, and a list of resources by Judith Sebesta. Exuding the author’s joie de vivre, warmth and enthusiasm, the book cannot fail to be a constant source of entertainment and to enhance the learning process by making learning fun. Every experienced teacher totes his or her own bag of tricks, those items so useful in the classroom, to enlighten, clarify, reinforce, and entertain. However experienced the teacher, additions to these bags of tricks are always welcome. In Farrago Latina, Gaylan DuBose opens up his own bag for us — and it’s quite a large one. As its name suggests, Farrago Latina offers an excellent medley of ideas, resources, games, drills, facts, and general inspiration. And who among us couldn’t use some?